Our Punched Rug Contest winner for October is Laura Berlage from Hayward, Wisconsin. 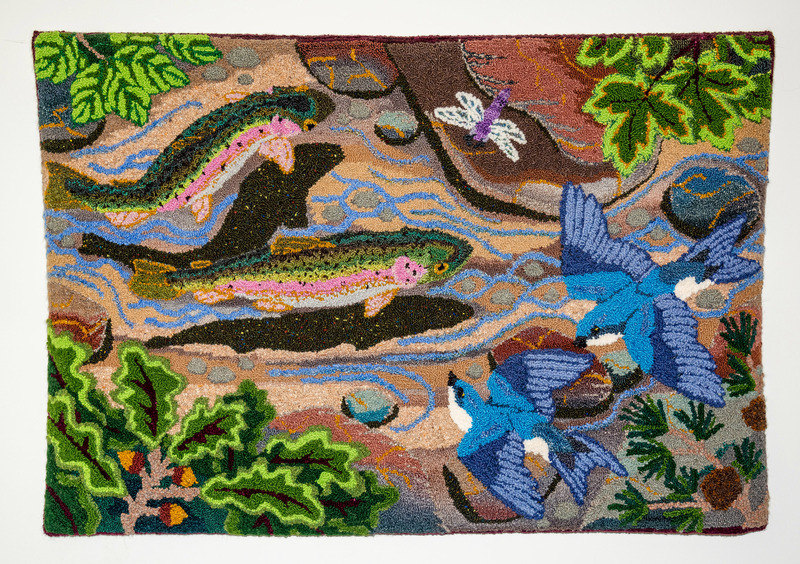 Laura’s winning rug is called Trout and Swallows. Congratulations Laura! Your rug is gorgeous! Trout and Swallows. Designed and Punched by Laura Berlage from Hayward, Wisconsin. 38” x 25”. Punched with a #14 fine “Mini” and #14 fine “Mini With Heels” Oxford Punch Needles. Wool, alpaca, Navajo churro wool, wool mohair blend, and gold shimmer thread on cotton monk’s cloth. 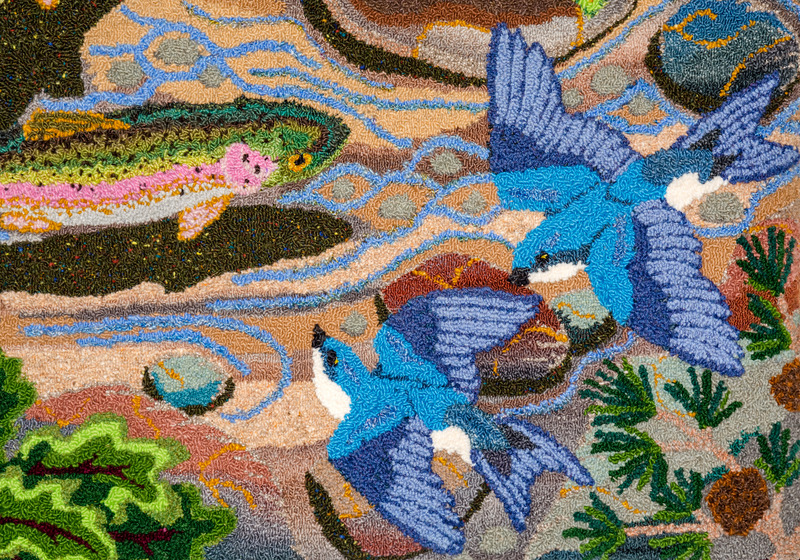 As alluded in the description submitted, each element in the punch needle tapestry has a symbolic element, special to the celebration of Ann and Steve’s union. 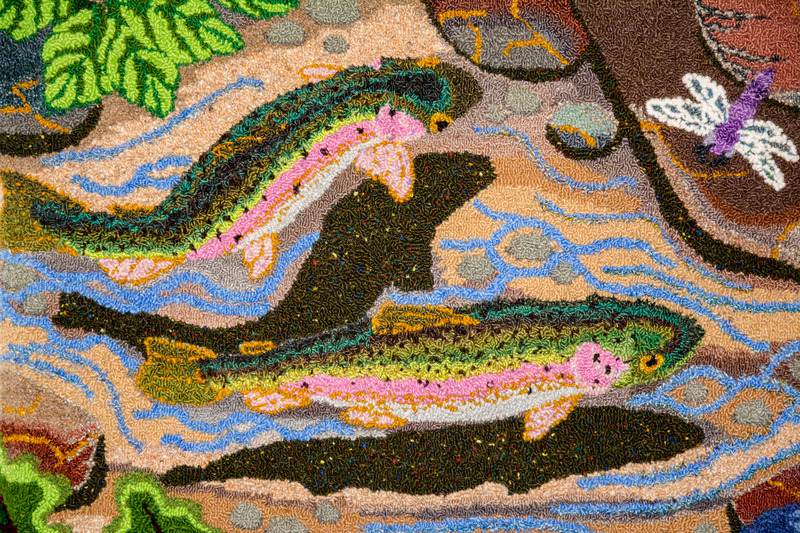 Rainbow Trout—Strong reason to go forward with conviction. Strong in family and morals. Tree Swallow—Protection, warmth, home, and proper perspective. Oak Tree—Strength, wisdom, maturity, and steadfastness. Maple Tree—Wisdom of balance, promise, and practical magic. Beech Tree—Tolerance, patience, and lightness of spirit. The diversity of colors and fiber textures used offered many visual layering options when building the sense of depth in the piece. For instance, the swallows are closest to the viewer, conceptually, followed by the leaves and dragonfly, then the level of the water, then the fish and stones in the stream. The use of shadows and shading were critical in creating this sense of depth, as well as choices in where to use warm and cool color tones. But the biggest challenge was in deciding how to represent the flowing water. The fish are under the water, but I wanted them to be clearly visible. In a shallow trout stream, the pure water often does not posses any color at all, except where it is disturbed in its course around objects. This is how I came to using the gentle blue lines to show the movement and hint at the water being there–allowing the viewer to fill in the rest of the “idea of water” in their own mind. Due to the size loom that I had, the piece had to be worked one-half at a time, starting with the trout side. However, the center trout’s head was right at the loom edge and had to be worked once the piece was moved on the frame. That meant saving bits of each of the shading colors and staggering the ends of rows I worked, so that there would be an even blending and no sense of a harsh splicing line to the viewer. The two punch needle sizes add some actual physical depth. The swallow, closer leaves, and dragonfly are made of longer loops than the rest of the piece, so they cast their own small natural shadows too. Textile arts are never fully two-dimensional, which for me adds to their magic. This was only the third piece I had ever attempted in this medium! It is certainly one of my favorites and an inspiration for future works to come.